Christ’s statement that He Himself is the Truth is a description of the nature of Truth, as well as its content. In saying this, we must accept that Christ’s claim is that Truth is not at all the sort of thing we generally consider when we ask for “the truth.” It is not a syllogism, nor a philosophical formula, or even a precisely stated account of history. It is not truth as yielded by carefully sifted evidence. If Christ is the Truth, then Truth must be understood as Person and not as concept. To acknowledge Christ as the Truth is both to acknowledge that we have been mistaken about the nature of truth itself, as well as to accept that Christ Himself is both content and character of the Truth. In saying that Christ is the Truth, and that the Truth is thus understood as Person, is not to say that Truth is a category – or merely an event within history. For the Christ who reveals Himself as Truth, also reveals Himself as the Alpha and the Omega, the Beginning and the End (Rev. 1:8). He is both the “Lamb slain from the Foundation of the Earth” (Rev. 12:8) and “He Who is, and was, and is to come” (Rev. 1:8). There is no conflict between what we know and what we shall know. Conflict only arises when we claim to know what we do not know. We cannot assume certain fixed principles from which we may deduce the Truth of things – for such principles and deduction cannot pierce the veil that lies over all we see nor the cloud that darkens our heart. We do not therefore reject knowledge that has not reached its fullness – but we do not call the knowledge we have the “fullness of the Truth.” That fullness awaits us. On the level of our daily lives, this understanding asks us not to look to the past for our meaning: we are not defined by our history but by our end. To know what we are, it is necessary to know what we shall be. 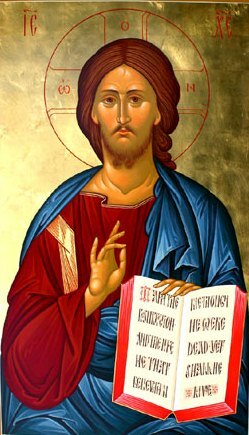 Christ is, for us, both the icon of the Truth and the Truth of which He is the icon. To answer the question of what we shall be, the truth will only be found in Christ – who is both the revelation of God – but also the revelation of what it is to be human: fully God and fully man, He is our definition. I enjoy your journal, as it is fed to my reader feed and each day I read it. I recognize the holy icon from my parish, the first I ever truly looked at and that knew me. Alice, It’s St. Maximus the Confessor and St. Ambrose I cite for this model of truth/icon/shadow. The quote in Genesis 3:15 still would not make true sense until it is fulfilled in Christ. It is, indeed, a good example of what they speak about. In their model, the light that makes truth clear is eschatological – thus NT is icon – it clearly depicts and reveals the truth, but even the NT looks towards a complete fulfillment in that age. Of course, sense truth is eschatological, and thus free of time, so that it tabernacles in Gen. 3:15 and in the NT, but triumphantly, with no measure of hiddenness in the eschaton itself. Then you are suggesting a disconnect between the Faith of Abraham and the faith of the Apostles? Beautiful meditation, Father. Thank you. Alice, by no means: “Your father Abraham rejoiced to see My day, and he saw it and was glad.” I can think of no better statement of Abraham’s eschatological vision. What I am saying is, in following St. Maximus and St. Ambrose, the OT’s expression of that eschatological vision is not as clear (on an obvious level) as the NT, and that the NT is not as clear as will be the eschaton itself. However, in knowing Christ who is the Alpha and the Omega, we are able to see the faith of Abraham from end to beginning. The disciples did not understand the meaning of the Scriptures until after the resurrection, when, beginning with Moses and Prophets, Christ explained all those things concerning Himself (luke). There is no disrupture, though nothing is clear until Christ makes it clear. The content of the faith of Abraham is made manifest to us in Christ. We can see that faith manifest in the OT because we know Christ, but cannot know it apart from Christ (or certainly did not know it apart from Christ). The prophets saw it, but it remained largely hidden. I can see where that is a disconnect. But surely the sacrifice of Isaac, looked forward to a greater sacrifice, of which that story is prophetic, or we could say a “foreshadowing.” But until the greater sacrifice took place, the sacrifice of Isaac would have been less than clearly understood, etc. If there was a disconnect, it would have been in the mind of those who sought to understand the OT apart from Christ. Thus St. Paul says: “But their minds were blinded: for until this day remaineth the same veil untaken away in the reading of the old testament; which veil is done away in Christ. But even unto this day, when Moses is read, the veil is upon their heart. Nevertheless when it shall turn to the Lord, the vail shall be taken away (2 Cor. 3:14-16). The faith of Abraham and the faith of the Apostles are one and the same. Abraham had a better understanding of God’s plan of salvation that many Christians today. As a Horite, his eschatological vision was fulfilled in Jesus’ incarnation, death and resurrection. Because the Divine Ruler-Priest rose incorruptible from the dead, so might His people. The Horites expected this birth, death and resurrection of a divine Son based on the promise of Gen. 3:15 made to their ancestors. I believe that the proof of that is their exclusive intermarriage, as evidenced by the Genesis genealogical data. The Horites were a caste of ruler-priests who were devotees of Hor/Horus who they called “son of God.” He was said to rise in the morning as a lamb and to set in the evening as a ram. This is a key element in understanding Isaac’s question, “Here is the wood for the fire, but where is the lamb?” Indeed that the question that must be answered. Abraham responded that God Himself will provide the lamb, but instead God provided a ram. As the west is the direction of the future, we have a sure eschatological message. Some say that Christianity is a conspiracy based on the Horus myth. The pharaohs ruled on earth as the embodiment of Horus, the divine son. However, as powerful as Amenhotep III was (his kingdom extended from Nubia to Syria), he died and did not rise from the grave. His great tomb testifies to his hope for life after death and his mummified body testifies to his hope of bodily resurrection from the dead that he might not die the “second death” (Rev. 21:8). If there is a correspondence between the Horus myth and the story of Jesus, it isn’t because Christianity copied the Horus myth, it is because Abraham’s people were Horites who believed the myth and looked forward to its fulfillment in the future. Thanks for the clarification, Father. I was sure that you weren’t suggesting a disconnect, but some readers might not understand that. Thank you for shedding light on the difficult subject of disconnection. In Genesis 3:24 we see the Lord driving man out of Eden, but stationing cherubim with flashing sword, to guard the way to the Tree of Life. (Man lives as it were, but cut off from his true past and future). The claim of Orthodoxy is that it is pre-divisional — and that is an important distinction in a world where everything, from thought to deed and language is fractious. Not everybody who comments knows others who comment. Alice is a theologically trained scholar, is Orthodox, with a particular specialty in Genesis, including the import of the historical anthropology that is evidenced there. It’s an honor when she posts, and always a learning moment for me. What you say is very important for us to hear. And it has profound implications for science. And could be freeing for those bound up in scientism. And so many are deceived by this false religion/idol in our culture today. Thank you Father Stephen, yes I was aware of that. Jesus Christ is the Truth! Glory! Thank you Father Stephen for this wonderful post! I’m looking for a specific reference for your Ambrose citation, but haven’t been able to find one. I’d be most grateful if you would point me to a reference. Thanks, Father Stephen! That’s an excellent reference! I’m glad that my comment was helpful. Thanks for your kind words, Father. As Bishop Zizioulas discusses in “Being as Communion”, the “shadow/ikon/truth” paradigm is deeply grounded in ancient Greek philosophy and is reflected in the Epistle to the Hebrews, among other places. The use of the word “truth” here is potentially confusing. A key term not used in this discussion is “participation”. The shadow and the ikon each “participate” in, and therefore manifest, the “truth”. “Truth” here refers to the highest, most clear manifestation of reality It’s use does not imply that the shadow and the ikon are false, but rather, quite the opposite. Fr. Greg, sounds like a Platonic formulation. I’m confused by the last sentence. To be human means to be fully God and fully man? Do we expect to become “fully God”? Or is that a way of saying, fully united to God, but still as dependent creatures. Sorry. I was referring only to Christ, who is fully God and fully man – he is still the model for what it is to be human (fully man). This is good stuff Father. Thank you again……………and again.